NEW Certified Organic Glory Oil is a miraculous night and day treatment oil pioneered to reduce the appearance of scars and fine lines and restore you skin to its true glory. NEW Certified Organic Glory Oil is a miraculous night and day treatment oil pioneered to reduce the appearance of scars and fine lines and restore you skin to its true glory. A drenching certified organic blend of unique organic super seeds: INCA INCHI + ACAI + PUMPKIN SEED OIL. This healing treatment oil devloped by Eco by Sonya reduces the appearance of scarring, fine lines and wrinkles and soothes irritated skins. Glory Oil is quite literally a gift sent from heaven. The certified organic omega abundant super seeds are meticulously blended to restore you skin to its true glory. 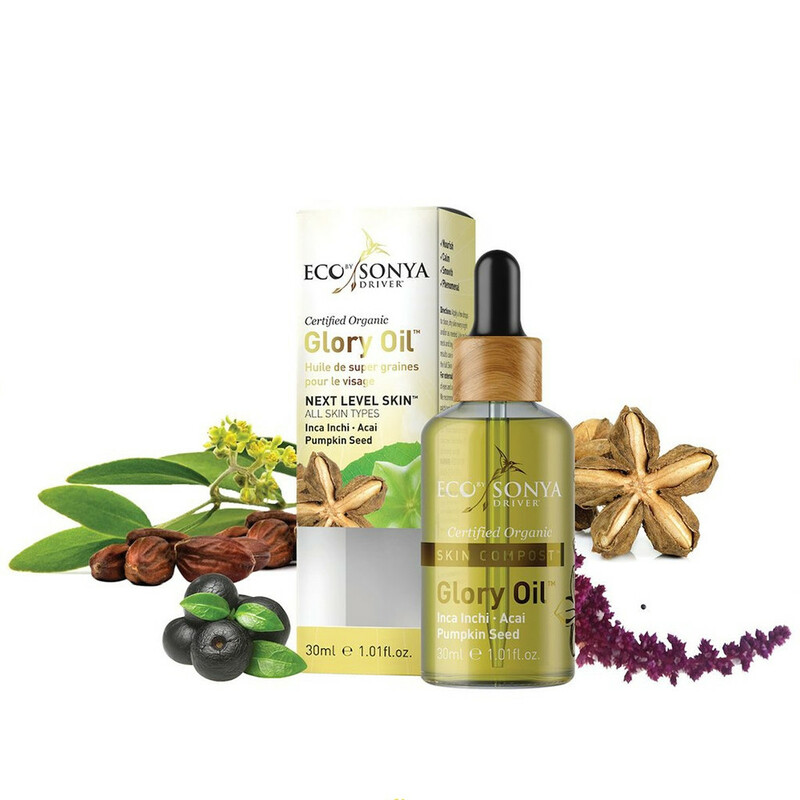 Glory Oil harnesses the phenomenal healing powers of organic super seeds to heal, sooth, reduce sign of ageing and assists in restoring moisture balance to your skin. Plumps the skin, fine lines & wrinkles while smoothing the complexion! Improve lipid function in dry skins, whilst reducing TEWL (Transepidermal WaterLoss) in dehydrated skins. Apply a few drops to clean, dry skin every night and/or morning on face, neck and beyond. We recommend a patch test. Gently massage into the skin. (also known as Sacha Inchi, Inca Peanut, Sacha Yuchi). Native to the highland tropical jungles in the high altitude rain forests of the Andean region of South America. An ancient Peruvian Omega (3, 6 & 9) abundant super seed oil high in antioxidants and the ultimate anti-ageing & healing ingredient. Inca Inchi contains one of the highest content of PUFA’s among oily seeds and is a Fair Trade ingredient. An antioxidant powerhouse that helps protect the skin from environmental aggressors and reduces the appearance of ageing by helping to restore moisture balance.